If you want to be a Multi-Platform Journalist and work in this digital age then the BA Multi-Platform Journalism degree at the University Centre Grimsby is perfect for you. Accredited by the Broadcast Journalism Training Council (BJTC), and seen as one of the best in the UK, the programme teaches you how to master the many skills that journalists need today – writing and interviewing for different platforms; shooting and editing video for TV and online; recording audio for radio and podcasts; presentation and voiceover skills as well as how to use social media as a source and promotional tool. Students embrace not only how to use traditional methods of audio and video capture but also how to use iPods, iPhones and smart devices to create content. 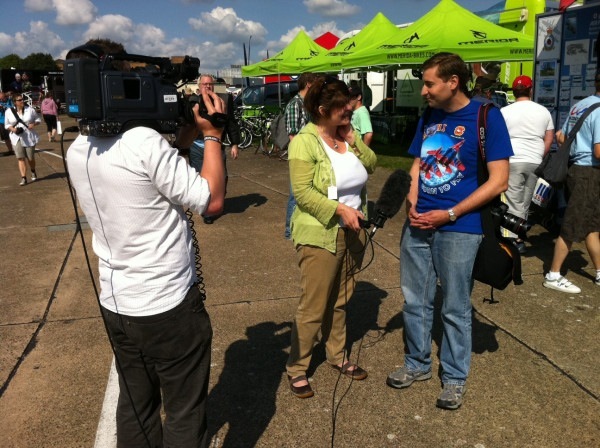 Seven TV recently asked me to present their special from the RAF Waddington Airshow this year. Now I’ve done this job, for at least the last eight years, and for the first time last year was able to tweet from the event. This year I was tweeting away and again was able to meet up with some fellow tweeters – @RAFBBMF – now they’d organised a tweet meet at their stand and I was then able to go international and interview @Alvarito who had come all the way from Madrid, Spain. Some of the others chickened out from being interviewed (they know who they are!). Once again it shows the power of Twitter and I’ve been fortunate in the last two weeks to meet more of the people I’ve engaged with on there. It’s a great way to engage with people and even better when you meet them in the flesh. East Coast Media’s journalism team are industry practitioners, something which is vital to know when deciding what course you wish to take at university. Programme Leader, Emma Lingard, has worked in journalism for the last 20 years. From newspapers to radio and television to online, she has been there and done it. Alongside running the BA (Hons) Multi-Platform Journalism degree at East Coast Media (GIFHE) she also spends time working in industry as part of continuous professional development. She can be found in the newsroom of the Grimsby Telegraph producing video content for their website, as well as writing articles. Emma is also a keen advocate of social media, especially Twitter (@rosereiki, @eastcoastmedia) and blogging. She was also responsible for helping train the first batch of print journalists into VJs for the Press Association alongside David Dunkley-Gymiah. She also works on TV programmes,which are broadcast on virginmedia. She recently presented a studio discussion programme called The People’s Jury and has spent the summer covering some of the big events for broadcast later this summer. For many years she fronted a programme about the history of Lincolnshire’s villages called Lingard’s Lincolnshire Rambles and has produced some one-off documentaries, Spotlight on Spurn, To the Manor Reborn. Also teaching on the degree are Fiona Young, who worked with Emma at the Grimsby Telegraph in the 90s, before moving on to the Press Association. Fiona is our media law tutor. The latest recruits to the team are Ian Barnsley, who came to us from the Lincolnshire Echo and Hugh Riches, who is an ex postgraduate student of ECM and a published journalist. Teaching radio, we have ex-BBC Lincolnshire reporter, Chris Jones and Andy Wilkins delivers our online modules. We’re always looking for people to add to our teaching list and regularly invite guest lecturers in. In the past we have had people deliver workshops on online writing, video journalism, etc, so get in touch on 01472 315550.